Because I am young, I am supposed to say yes (according to 86.3%), but I am very thankful to be able to say no. Perhaps it is mostly because I am wading through thousands of dollars of debt (thank you, college education!) or perhaps it is simply because I like to “unplug” after working at a computer all day. Either way, I do not have a burning desire to own the newest or greatest technological device. To check out the full technology report, click here! Let’s be honest—I may not be able to afford the newest/latest/greatest technology, but I also cannot afford gas or a home phone line. Thus, more of my communications with friends and family happen digitally as opposed to in person. Most people my age (in the 18-34 range) do communicate more through impersonal means, like texts or IMs (52.1%), vs. personal methods, like face-to-face or over the phone (30.0%). For me, digital doesn’t have to mean impersonal. I still prefer face to face communication above all others, but sometimes I need digital ways to set up some face time with the ones I really care about. I won’t lie, I am addicted to Facebook—this social media tool makes it so quick and easy to invite people to a party, post photos for my cousins who live hours away, or simply say hi to people I rarely get to see. Again, if you’d like to check out the technology report, here’s the link! So what about you? Are you a tech addict? Does your smartphone rule your life or do you? How do you balance digital and personal communication in your life? Some of our more curious data this month came with our practicality measurements. As you can see, those who said they’ve become more practical in their purchasing within the last six months – the dark blue line on the chart – decreased from 49.9% in July to a current 46.8%. With confidence dropping so sharply, one would think that consumers would become more apt to watch their spending. We saw the same movement with those focused on needs, rather than wants this month as well. 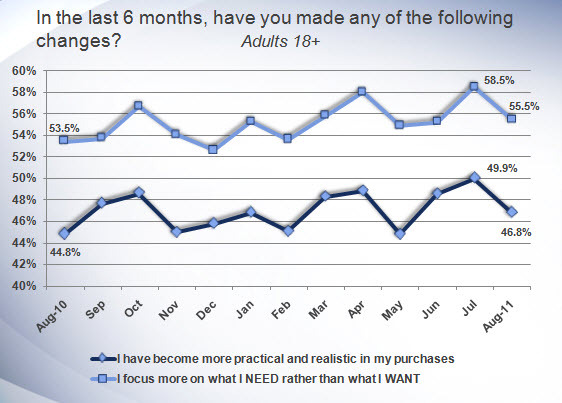 55.5% currently say they are focused on the necessities, lowering from 58.5% last month. So it appears that consumers’ concerns – so far – stem from more macro-environmental issues, like the Debt Crisis, unemployment, et cetera. The downward view of the economy hasn’t bled into personal concerns…well, at least not any more than it has already. You can also see in the chart that, over the past year, we are still seeing a slightly upward trend in practicality and necessities. So, downward movement this month won’t be signaling any spending free-for-alls. And consumers are really remaining cautious about how they spend. So, we know what consumers plan to do with their finances over the next three months (pay down debt, decrease spending overall, increase savings), but we asked a couple of questions in August that attempt to capture their financial mindsets. 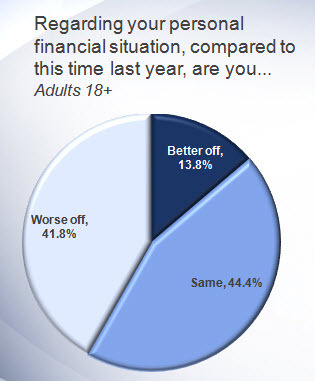 Two in five feel about the “same” financially, while just a slightly lower number say they are worse off. Only one in ten says they are better off compared to a year ago. We also asked consumers if they felt there was “too much month” at the end of their paychecks. So, in other words – is the month outlasting your take home pay? A whopping 50% of consumers feel short on cash “all” or “most” of the time. One-third feels this way “sometimes,” while fewer than one in five say they “never” feel this way…this is by far the smallest proportion of consumers. So, with all this data on how consumers feel about the economy, employment, and their personal finances, it’s high time we take a look at how they plan to spend over the next 90 days, with our BIG Forward Look. Over the next 90 days, do you plan on spending more, the same, or less on the following items than you would normally spend at this time of year? The results are then tabulated into our Diffusion Index (Spend More – Spend Less) and compared to previous periods of time. In the chart displayed on the screen, we are comparing August 2011 results with July as well as August results for the past two years. Compared to a month ago, all categories – except for seasonal Lawn & Garden – are up. Declining practicality and the Back-to-School shopping season probably played a role in this. And, all categories, save for Home Improvement, have also perked up from recession addled August 2009. So consumers are still feeling better than they were during the recession, but things are looking downcast compared to one year ago. Current economic sentiment and lack of improvement in the job market are likely to blame for that. Finally, when we compare this month’s results to pre-recession August 2007, all categories are down. This really shouldn’t come as a surprise, though, given consumers’ economic sentiment this month. The word “recovery” just isn’t in consumers’ vocabulary just yet. That’s all for this month! Keep watching for more blog articles on technology, the economy and of course the consumer! This month, I will be reviewing the latest big insights on confidence, practicality, and personal finances, as well as our BIG Forward look. The August Consumer Intentions & Actions survey was collected August 2nd through the 9th and includes the thoughts of more than 8,600 consumers. Finally, we’ll take a BIG Forward Look with 90 day purchase plans. I’ll start off here by pointing out the obvious in this chart – Consumer Confidence fell off a cliff in August. This month, only one in five is very confident or confident in chances for a strong economy, the lowest reading in more than two years. 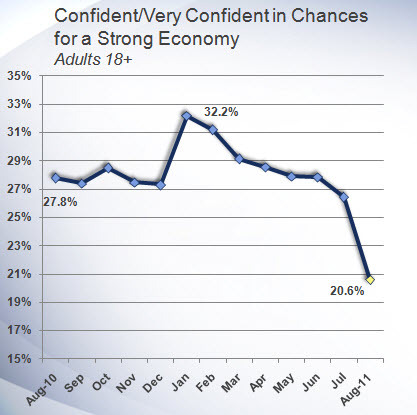 Back in March 2009, confidence was at 19.5%. This month’s reading also represents a 22% drop from July. The decline in confidence this month appears to be at least partially politically motivated. At the time the August survey was collected, the Debt Crisis was the top news feed. And this month, 24% indicated they worry more about political or national security issues, which was our highest reading since January 2010. Now take a look at confidence over the years. 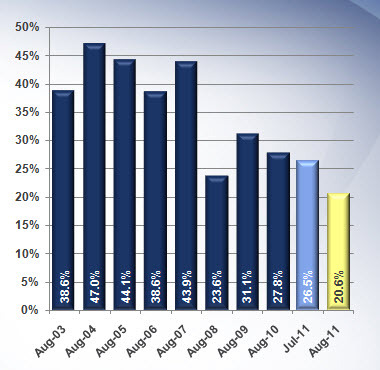 As you can see, this month’s reading is the lowest August reading going back to 2003. Back in August 2008, just before the bank failures that solidified the recession for consumers, confidence was three points higher, at 23.6%. In a “good” economy, we’d expect confidence levels in the 40% range. It’s a pretty well-known fact that lower unemployment is the lynchpin for the basis of solid economic recovery. With unemployment at 9.1% currently, the foundation for recovery is still not set. Consumers know this, and they worry about this, which is evident from this month’s data. 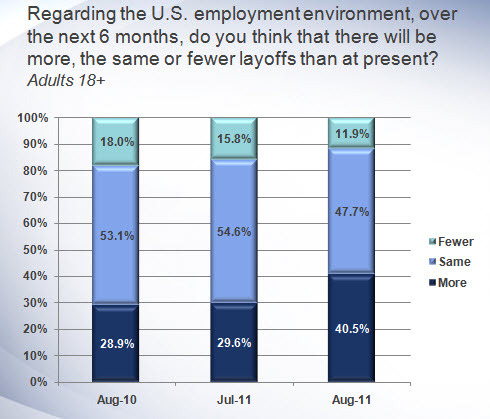 In August, two in five consumers felt that we would see “more” layoffs over the next six months. This represented a 40% increase from the sentiment a year ago. Declining confidence, the debt mounting on Capitol Hill, sliding stock market, and general disdain for the lack of improvement in the unemployment rate likely contributed to this dramatic increase. About half of consumers feel that layoff levels will remain the same…and let me remind you that more of the same means sticking with a 9% official unemployment rate. Only one in ten see improvement in the future for the employment situation…that’s almost half the number of people who felt this way one year ago. Stay tuned for my next post–I’ll be looking into personal finances and spending plans! !